About a year ago, National Runaway Switchboard came to LPK with a simple task: uncover whether or not the brand impression they were leaving was living up to their mission—to keep America’s runaway, homeless and at-risk youth safe and off the streets. In the crowded universe of not-for-profit offerings and messaging targeting tweens, teens and young adults, staying fresh and relevant is a must. They knew they needed to find ways to better connect with today’s youth. NRS was originally established in 1971 to provide comprehensive crisis intervention for young people in Chicago. 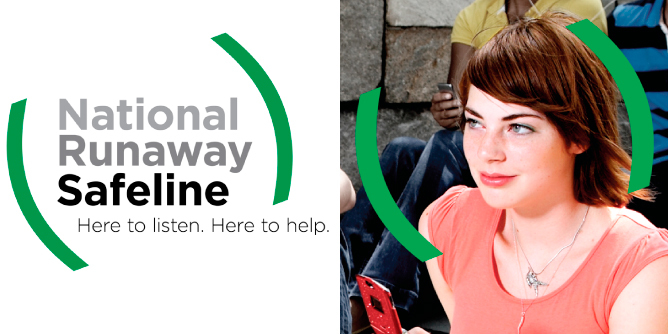 Today, the NRS’s 1-800-RUNAWAY crisis hotline manages over 100,000 calls per year across the United States and they are recognized as the only federally appointed system designated for national communication for runaway and homeless youth. LPK and the NRS team, which included NRS leadership, frontline staff and board members, collaborated over several workshops to uncover and focus on two key elements of their organization’s brand strategy—their purpose and their point of difference. By leveraging national research in combination with interviewing local high school youth, we were able to uncover four specific key insights that became the focus of our energy. We learned that this is an issue that crosses socio-economic boundaries, and not always an issue of youth leaving home out of their own desire—many times they are forced to leave or are simply left homeless by neglect. We also learned that one perception of NRS was that their objective was to track down youth and send them back to the homes they were running away from. The truth in the matter is that, for many, going back home is not always the best solution. Therefore, many youth do not see themselves as runaways. Lastly, and maybe most important to our new brand and verbal strategy, the term ‘switchboard’ is not relevant. LPK went to work to develop a brand strategy that would serve as the platform for connecting the organization’s mission with how they tell their story and help them begin to get credit for the importance and impact of their mission on the youth of our society. NRS deals with highly charged, emotional issues. As such, the new name and identity needed to convey their core promise of safety and anonymity. LPK created several naming options along a communication continuum and tested them with local teen audiences, recording their reactions, interpretations and impressions. In addition to the new name and tagline, LPK recommended keeping 1-800-RUNAWAY as a key equity element in communications as it has significant recall and speaks to their national reach, but also directs youths to their helpful website. To further bring redefined brand strategy to life, LPK developed a new identity system that better reflects the “focused on you” position for NRS. 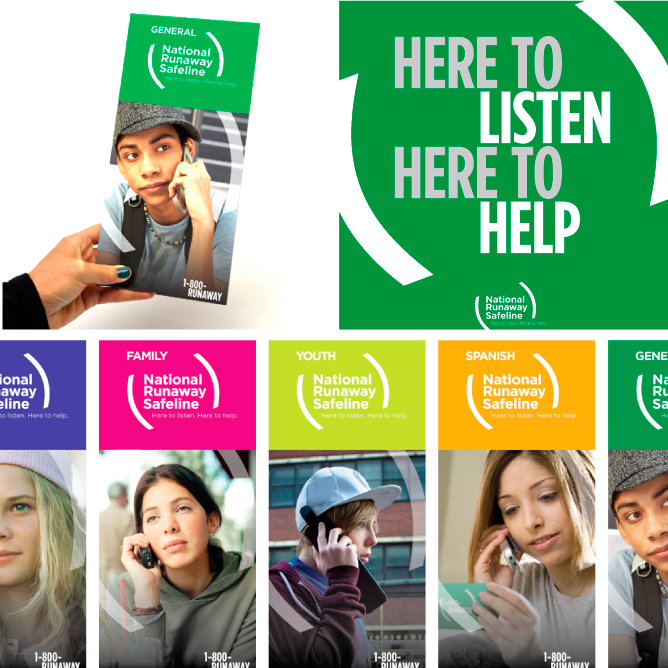 The primary design elements are used to focus in on moments of connection and to highlight specific messages. 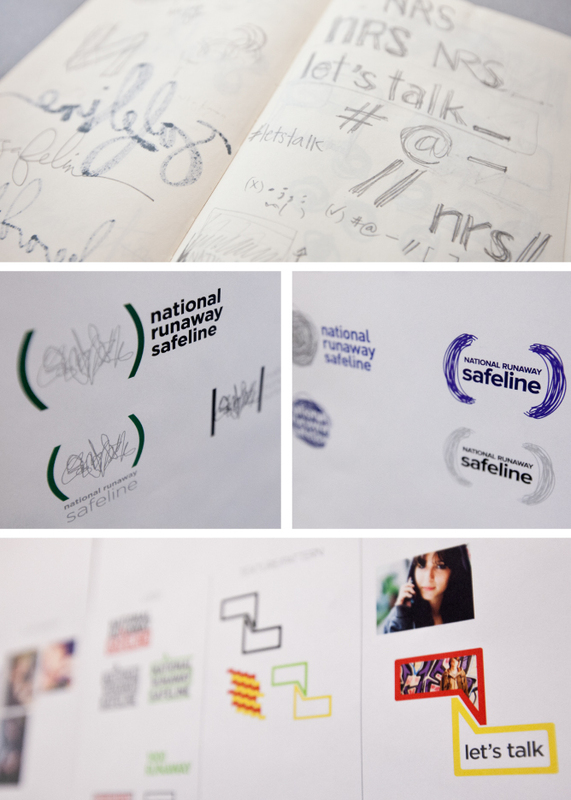 The typography of the primary identity is gradated to further push the emphasis on “Safeline” to reflect the importance of safety first. In addition, we shifted the photography strategy to demonstrate the outcome of their work, focusing on hopeful expressions rather than sad or depressed images of teens. Images are also more diverse in location and demographic to help further the idea that these runaway situations can happen to anyone in our society. As we witnessed the new brand strategy come to life just last month, our work with NRS has been inspiring for many of our team members. While NRS is already a well-established organization, they are now positioned to grow positive awareness of their mission through revitalized brand expression. The outcome proved to be one we are proud to hang our hats on and we continue to look forward to working with NRS.